It kind of took us by surprise, but last year suddenly everyone was talking about the restaurant scene in Pittsburgh. Food & Wine, Saveur, Eater and others chimed in, and soon the accolades began to blend together. Old clichés about steel mills and fries-on-sandwiches were starting to disappear, replaced by new clichés about “artisanal” this and “farm-to-table” that. Sure, this kind of attention misses the decades of hot, hard work in crowded kitchens that got Pittsburgh to this point. It’s not just the chefs and restaurateurs who took a chance—on a style, an ethnic cuisine, a neighborhood, their own talent—and kept at it, even if it took diners a while to catch up. It’s also about the bartenders, butchers, bakers, purveyors, brewers, waitstaff, even the local farmers, who all had to step up their game at the same time. So did Pittsburgh rise to meet the sky-high expectations in 2016? Of course, 2015 was a tough year to top, particularly when it came to the restaurants that snuck in at the very end: Morcilla, Smallman Galley, The Whitfield. But 2016 was full of surprises as well, keeping those accolades rolling in. Vegan Central/Eastern European hardly seems possible, yet not only do Kate Lasky and Tomasz Skowronski pull it off, they do it so well that meat and cheese actually seem superfluous. They got started hosting the pop-up Pierogi Night—and their pierogies rival anything Grandma makes. There are a lot of pickled things on the menu which is where Apteka truly shines. If you can’t pronounce Cykoria I Sliwki (Belgian endive, pickled prune, beech and oyster mushrooms), ask . . . or just get the Baba Jaga sandwich, with Polish pickles, vegetable pate, pickle beets, smoked onion remoulade and mustard on a grainy, seed-strewn house bread. Chef Roger Li of Umami. 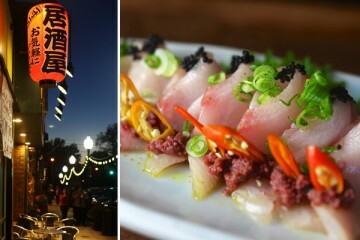 Above Round Corner Cantina, a new-Mexican spot with perhaps the city’s best back patio, you’ll find Umami. It’s a Japanese word for a pleasant savory flavor, one of the five basic tastes from which all dishes spring. It’s also a collaboration between Roger Li of the much-missed Tamari and Derek Burnell of Round Corner Cantina. 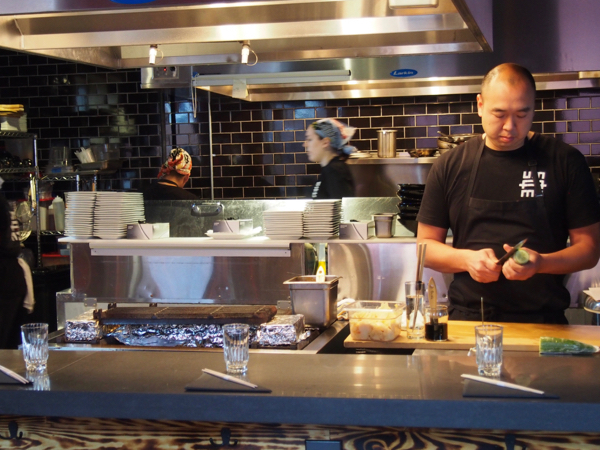 Umami is an izakaya, a type of Japanese pub that seems to be quite popular around here all of a sudden. Red paper lanterns reflect off polished wood late into the night, as revelers choose from robatayaki (slow-cooked on skewers over charcoal) of pork belly, Japanese eggplant, chicken skin, beef tenderloin, shrimp. There’s also sushi, takoyaki (grilled octopus balls), tonkotsu ramen, okonomiyaki (savory pancakes) and plenty of sake to wash it down. Open until 2 am Fridays and Saturdays. 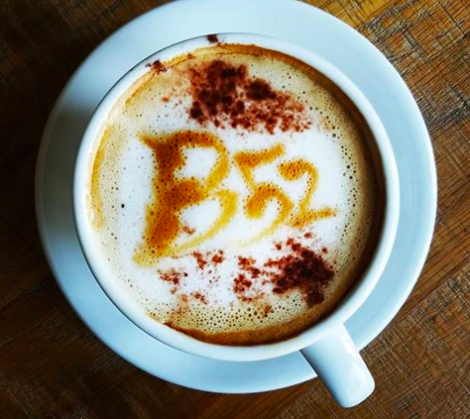 Great coffee concoctions await at B52. 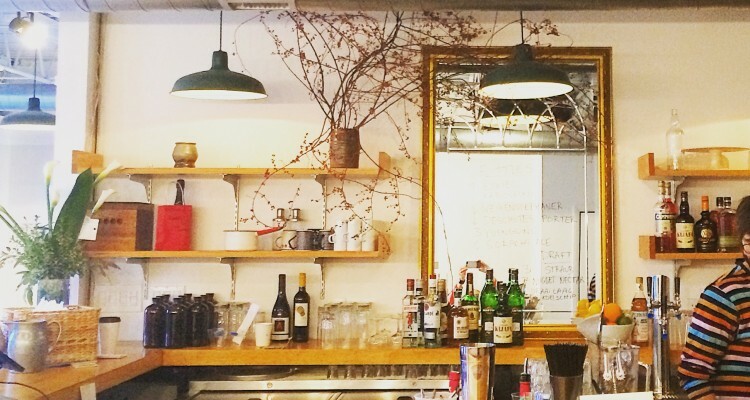 Curiously, yet another of Pittsburgh’s best new restaurants is vegan. B52 is mostly Middle Eastern, with a particular emphasis on baked goods, via proprietor Omar Abuhejleh who also owns Allegro Hearth Bakery in Squirrel Hill. Some dishes are meatless to begin with, like falafel and spinach pie. Others are successfully re-imagined without meat, like the Seitan Shwarma and Spicy Kofta Tofu. Manakish flatbreads are topped with Shiitake mushrooms, greens and garlic, among several options. B52 is in a bright, modern, minimalist space that fills up fast. They also have a full espresso bar and make their own chocolates and cashew cheese. At Pork & Beans on Sixth St. Downtown. Photo by Tom O’Connor. No, carnivores will not starve in this brave new world of Pittsburgh dining. Pork & Beans is another of the simply-titled, brilliantly-conceived projects from Richard DeShantz (Meat & Potatoes, Butcher and the Rye, tako). Keith Fuller of Root 174 is also in the kitchen, and the two are using their culinary firepower primarily to smoke and grill meats. 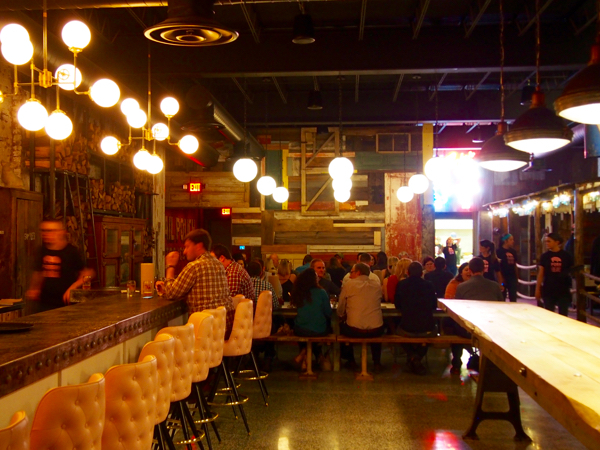 The look is rustic backwoods roadhouse barbecue, with lots of reclaimed wood, neon, a rusty VFW sign and even a chain link fence topped with barbed wire. The menu splits the difference between Downtown and the boondocks with sweet-yet-smoky spare ribs, lots of pulled pork, turkey and brisket, and house-made sauces. The bar at Hidden Harbor. Photo by Tom O’Connor. Tiki seems like one of those ironic, kitschy retro-styles that comes and goes every few years. But bar manager Adam Henry presents another story: an authentically American melting pot of exoticism (Polynesian, Hawaiian, Cantonese), South Seas nostalgia and perhaps the best collection of original cocktails outside the pre-Prohibition canon. Plus, tiki drinks use fresh fruit juice in everything. Tropic Thunder ($12), for instance, has a five-rum blend, lime, grapefruit, cinnamon, macadamia orgeat, grenadine, falernum, absinthe and bitters. The food is just as creative, with Polynesian and faux-Cantonese influences. There’s also Lomi-Lomi, a Hawaiian dish of salt-cured salmon, with cumin, red onion, jalapeno, tomato, citrus and wonton chips. Dunning’s Grill served “comfort food” such as the Pittsburgh specialty, the Turkey Devonshire. The new tenant, Ease, calls itself “Modern Comfort Cuisine,” which apparently means minimalist décor, and elevating classic dishes through new ingredients and/or creative preparations. This includes hearty, winter-friendly fare like Tater Tot & BBQ Pork Poutine, a Buffalo Burger—made with bison—Honey Chili Wings, and Short Rib Pot Roast. Co-owners Lauren Leon and Matthew Christie. Photo by Brian Conway. Sure, the name doesn’t make a lot of sense, and isn’t very appetizing. And yet . . . 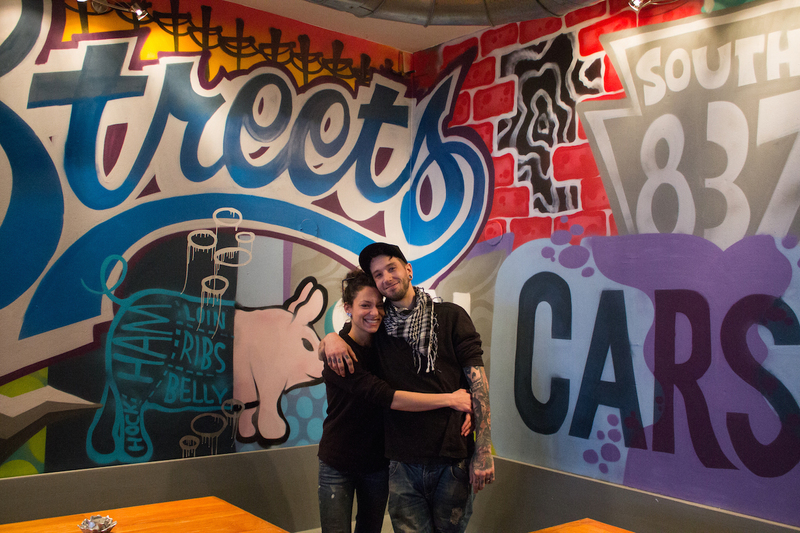 Streets on Carson’s sheer commitment to unusual takes on street food from all over the world is inspiring. The menu is weird, unpredictable and fearless—and hits its target more often than a lot of fancier joints in town. Each item comes with the location that inspired it. For example, there’s a Tostada from La Lagunilla Market (Mexico City), Lobster Crepe from Montparnasse (Paris), Chicken Samosa from Barakhamba Road (New Delhi), and Roasted Canoe Cut Beef Bone, a Streets on Carson original. Local ingredients are used liberally, no matter the dish’s origins. Not a person on the planet associates oysters with the muddy Monongahela River, but that doesn’t mean we can’t figure out how to eat ‘em like they do in Treme. Hey, the Saints stole black and gold so it’s the least we can do. Muddy Waters delivers a credible rendition of Cajun & Creole cooking—there’s a Po’ Boy and Seafood Gumbo of course, and some more offbeat fare, like a Crab Boil Reuben. Or, just go for the classic Oysters Rockefeller, with greens, bacon, parmesan and absinthe. Thankfully, it’s hard to tell that this was a grimy Laundromat a few months ago—a new front patio and glass garage door, and the savory scent of Taiwanese cooking has banished any lingering scent of soap suds. 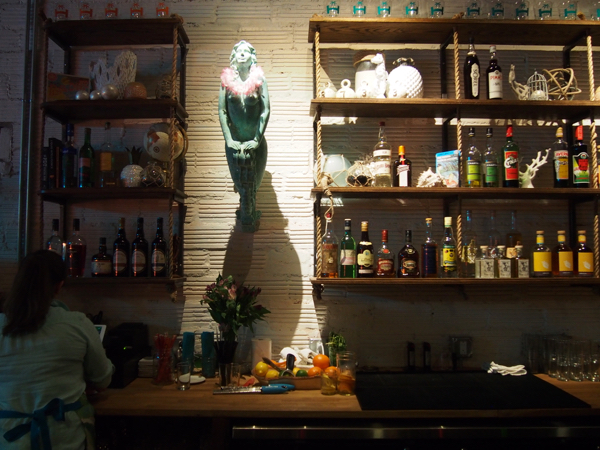 A lot of care went into the subtle, stylish lighting and décor of Café 33. The Chinese-only menu is enormous, and doesn’t hide the unusual dishes. Squid with Chinese Pickle Mustard Green and Intestine with Sour Cabbage are right at the top, like a challenge to the adventurous eater. Soup Dumplings, Potstickers and/or Minced Pork with Chives in Black Bean Sauce are a good introduction to Taiwanese cuisine, which tends to revel in subtle layers of spices rather than overwhelming heat.